French Doors make a huge improvement to any room. At The Home Design Group our uPVC doors are made by VEKA to the highest standard. We are proud members of the Independent Network of installers. 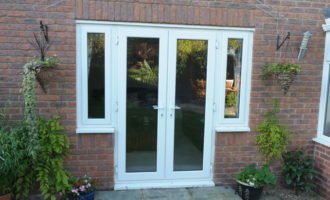 Updating your home with a secure pair of stylish French Doors changes the dynamic of any room. This update makes a room feel larger with the illusion of more space. Open up your home to beautiful views and brighter space with new French Doors from The Home Design Group. Usually customers place their French Doors to the rear of the house to allow family rooms to be linked to the garden for an elegant look. This also sets your home apart from the neighbours and is also an energy efficient solution too. Most importantly, our uPVC doors are made to the highest levels of energy efficiency possible. Firstly, choose from thermally-efficient reinforced door panels to heat-conserving double or triple glazing options. Because we want you to be safe in the knowledge that we always meet your energy requirements. Because everyone is different, our products are available in so many styles and options. Therefore you can get the perfect colour or shape to suit your home at The Home Design Group. Our experts are on hand to plan, install and complete the project from start to finish while there’s also support and guidance throughout from the HDG experts. Every project is managed from concept to completion, ensuring the best result. Be inspired to improve your home now with our great products and services. Have a look at the video below to see some of the styles and choices available. For more ideas and inspiration head over to our Facebook page or Instagram. Because we’re proud of the work we do, you can take a look at the results customers have had on the blog and make your appointment with the team. Call us on 028 9077 2077 or get your quote online now with our Price Builder.